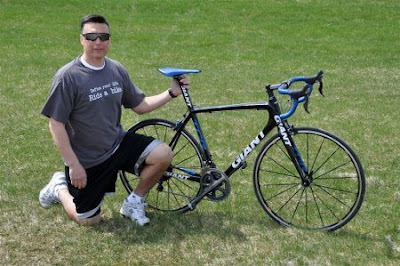 Meet Ray Hradek, and his brand new Giant TCR Advanced SL 1 road bike. It's one of the nicest bicycles we've ever sold, and fittingly, to one of the nicest people in Medina! The bike is Giant's lightest, fastest, stiffest road racer ever, and features Giant's formulaOne carbon fiber technology frame, a Shimano Dura-Ace drive train, and premium Mavic Ksyrium wheels. Thank you, Ray! To learn about how the formulaOne technology in Giant's carbon road bikes stacks up against the competition, check out the Giant Road Report Card (pdf document; requires Adobe Reader software). 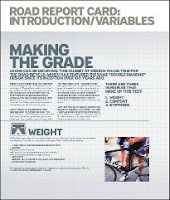 Executive Summary: The three primary factors that determine the quality of a road bike frame are weight, stiffness, and comfort. Giant engineers compared their TCR Advanced SL frame to the top-of-the-line frames from their competitors, including Trek, Specialized, Look, Scott, Cervelo, and Cannondale using objective, scientific tests to measure all three of these characteristics in each frame. While some frames scored higher in individual categories, the Giant TCR Advanced SL had the highest overall rating, with a B+ rating for weight, an A- rating for stiffness, and an A+ rating for comfort. *salivate* Mars Girl likes Giants.